Background/objectives: A decline in resting energy expenditure (REE) beyond that predicted from changes in body composition has been noted following dietary-induced weight loss. However, it is unknown whether a compensatory downregulation in REE also accompanies exercise (EX)-induced weight loss, or whether this adaptive metabolic response influences energy intake (EI). Subjects/methods: Thirty overweight and obese women (body mass index (BMI)=30.6±3.6 kg/m2) completed 12 weeks of supervised aerobic EX. 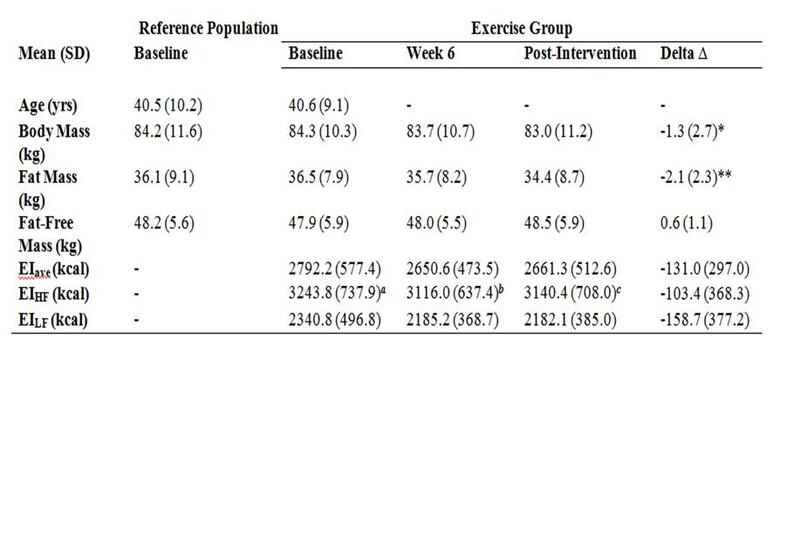 Body composition, metabolism, EI and metabolic-related hormones were measured at baseline, week 6 and post intervention. The metabolic adaptation (MA), that is, difference between predicted and measured REE was also calculated post intervention (MApost), with REE predicted using a regression equation generated in an independent sample of 66 overweight and obese women (BMI=31.0±3.9 kg/m2). Results: Although mean predicted and measured REE did not differ post intervention, 43% of participants experienced a greater-than-expected decline in REE (−102.9±77.5 kcal per day). MApost was associated with the change in leptin (r=0.47; P=0.04), and the change in resting fat (r=0.52; P=0.01) and carbohydrate oxidation (r=−0.44; P=0.02). Furthermore, MApost was also associated with the change in EI following EX (r=−0.44; P=0.01). Conclusions: Marked variability existed in the adaptive metabolic response to EX. Importantly, those who experienced a downregulation in REE also experienced an upregulation in EI, indicating that the adaptive metabolic response to EX influences both physiological and behavioural components of energy balance.